I’ve had an incredible start to my Fulbright in Syria. It’s been almost two weeks since I arrived — a perfect time for a quick update. My flight landed in Aleppo on Saturday night, around midnight. 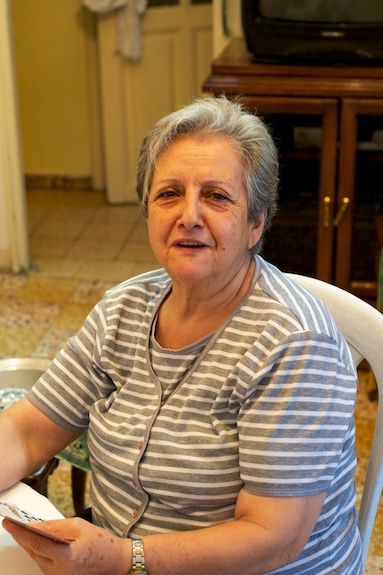 After 28 hours of traveling, door to door, I arrived at my grandmother’s sister’s house in Aleppo. Like a true Halabiye (Aleppan) she had a delicious spread of mezze laid out as soon as I walked through the door: muhammara (محمّرة), olives, pickles, homemade mortadella, hummus (حمص), labne (لبنة), zeit w za’atar (زيت و زعتر); I slept like a baby that night. 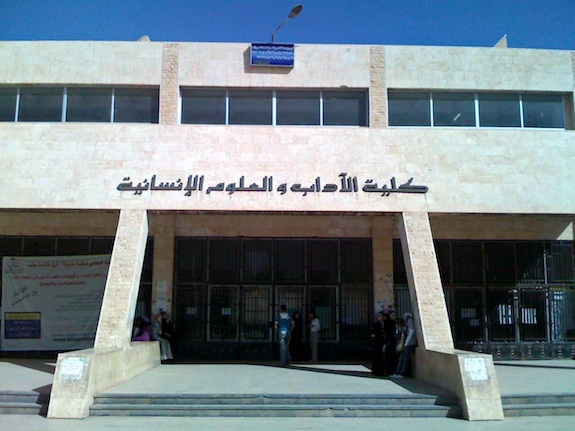 I spent my first few days doing administrative things: I got a cell phone, registered at the University of Aleppo, exchanged currency. I took a bus down to Damascus to meet with the other Fulbrighters as well as the Fulbright committee here in Syria. We were all invited to dinner at a restaurant called Marmara where we got to meet the Syrian Fulbright students who are getting ready to study abroad in the US. I think I’ve already gained five pounds since I’ve arrived. It’s hard not to. Everyday I come across new recipes that I want to blog about. I walk as much as I could and take the stairs whenever possible. My grandmother’s sister, bless her heart, pulled me aside the other day and asked whether I had a phobia of riding the elevator. I told her I take the stairs so that I can eat more of her delicious food. I’m sure she will hold me up to this for the next nine months that I’m here. The picture above is from a lunch I recently had at a friend’s house. 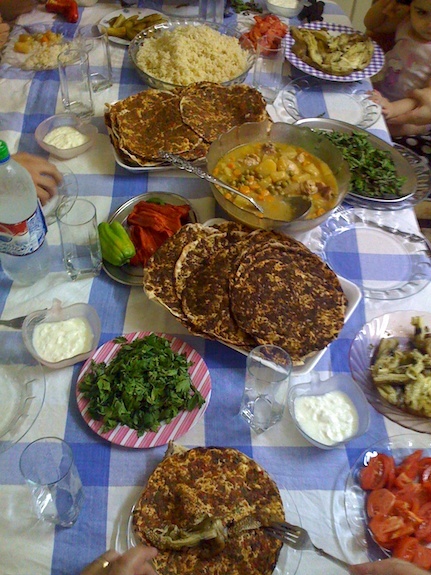 The star of the meal was the traditional meat pizzas called lahm bil ajin (لحمة بالعجي). I will have to dedicate a complete blog post to these pizzas. They’re incredibly delicious and are an important part of Aleppo’s cuisine. There are small bakeries in Aleppo where you can prepare your own meat mixture, and the bakery will make dough and form all the pizzas for you. My friend’s mom prepared her meat mixture in the morning and sent my friend and I later that afternoon to pick up the prepared pizzas from the bakery. I posted a few photos from the bakery to my flickr. Last Friday my grandmother’s sister prepared mujaddara for lunch. 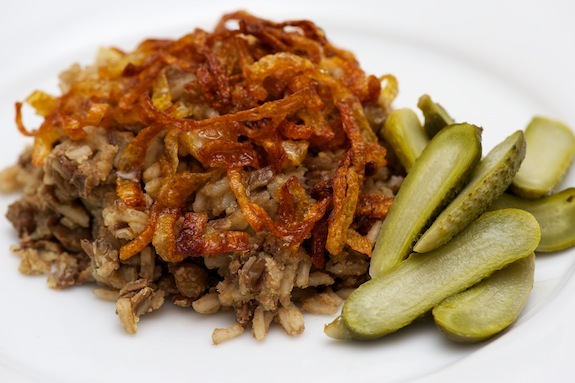 Mujaddara is a simple, but traditional Middle Eastern dish of rice and lentils. Some families make it with bulgur wheat, and in Egypt they add noodles to the rice and lentils, and serve it with a spicy tomato-based sauce. Egyptians call this dish Kosheri (كشري). The same day I had mujaddara at my grandmother’s sister’s house, I visited two friends, and both their families had also made mujaddara for lunch. For families that abstain from eating meat on Friday’s, mujaddara is a quick and healthy vegetarian meal for the family. I had photographed mujaddara before I left the States, but never got around to posting the photos on my blog. These photos are from then. Usually people will not fry the onions in extra virgin olive oil because it has a low smoking point. I prefer the taste of olive oil, so I take extra time to cook the onions over low heat for a long time until they become crisp. If you’re in a rush you can use canola oil or any relatively flavorless oil that has a higher smoking point. Pickles are traditionally served with the mujaddara. Saha w hana — bon appetit! 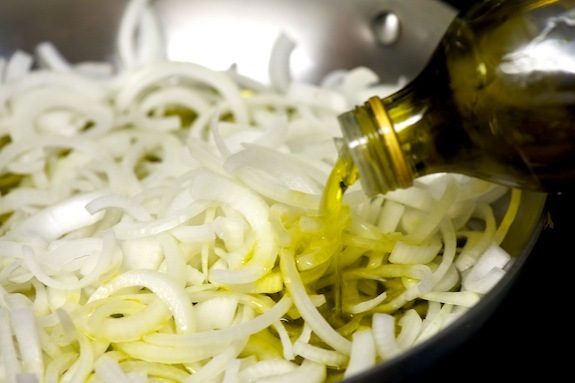 Add sliced onions and olive oil in a large skillet. Cook over medium-low heat for an hour and a half, stirring occasionally. If you like them very crispy you can fry them in canola oil over high heat — this method takes considerably less time. Season onions with salt to taste. 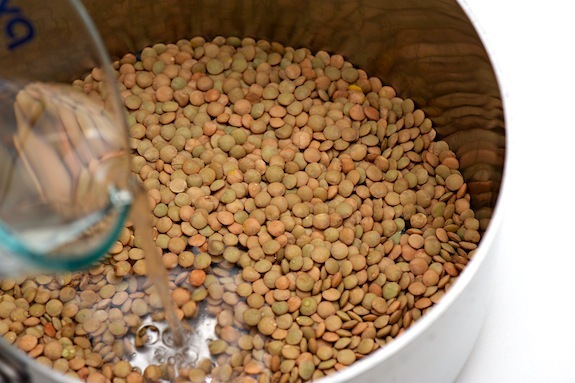 Wash lentils under cold water and remove any pebbles. Add lentils to a medium sized pot, and cover with water by 1 inch (approx 3 cm). 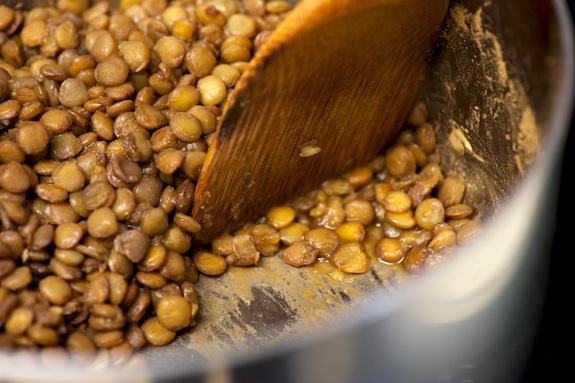 Place lid on the pot and cook over medium heat for approximately 15 minutes, or until lentils are al dente. Important: do not add salt while the lentils are cooking. Adding salt at this stage will make the lentils grainy. 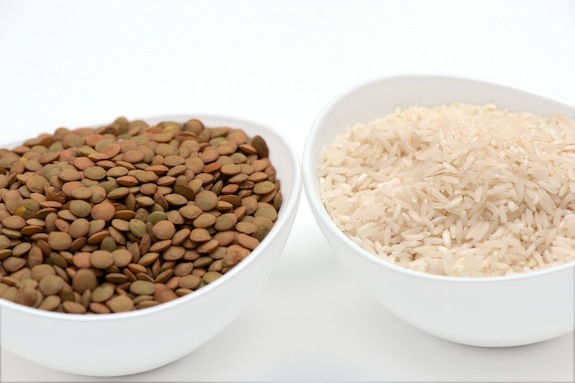 After cooking the lentils, discard any leftover water (if there is any). Add 2 cups of water to the pot and bring to a boil. Add the rice (or bulgur wheat), season with salt, stir once, and cover the pot. 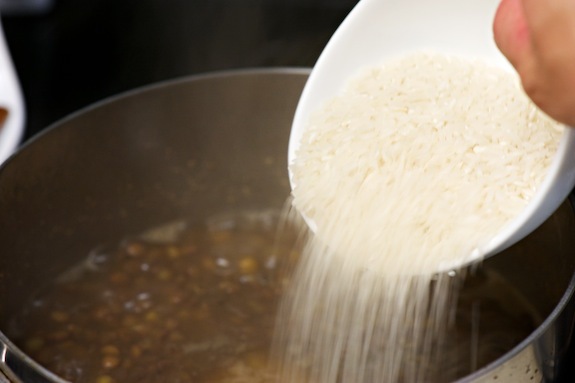 Lower the heat to low, and cook for 15-20 minutes, the same way you always cook your rice. Continue cooking your onions until they are crispy to your liking (the crispiesr the better, in my opinion). Serve the mujaddara on a platter and top with the crispy onions. Serve with pickles. 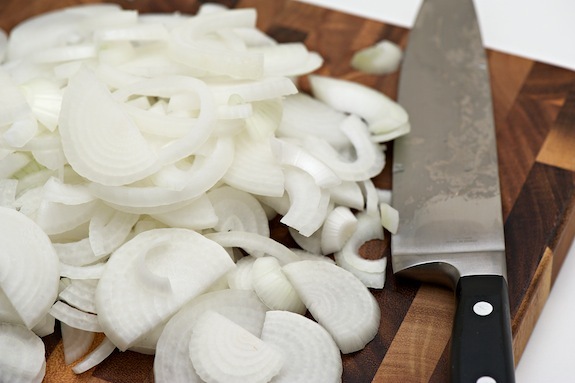 Note: If you are in a rush, you can fry the onions at a higher temperature using canola oil. Thanks Samir for the tip to discard any leftover the lentil water before adding the rice. Update (02/09/2013): Ever since I returned from Aleppo, I’ve been making my mujaddara with coarse bulgur wheat. I enjoy the flavor and texture more than the mujaddara with rice. You can find coarse bulgur wheat (often called Bulgur Wheat #3) at some Whole Foods or certainly in any Mediterranean market. Disclaimer: The opinions I express in this blog are my own and do not reflect those of the Fulbright program. Posted in entrees, Fulbright, Middle Eastern, recipe, savory by Antonio Tahhan on October 1st, 2010. You can follow any responses to this entry through the RSS 2.0 feed. You can leave a response, or trackback from your own site. What a beautiful post and photos! your mujaddara looks delicious! I didn’t realise there were country or regional differences to the Mujaddara, like the addition of noodles – the latter was what I thought was the typical dish. What a great spread your grandmother turned out, and I will be keeping an eye out for those meat pizzas, I’ve had them at lebanese restaurants here. Good luck with the program, and great to see you back in the blog world! I am Latin, always have beans and rice, but this recipe got my eye. Looking forward to hear more from you and your experiences. Your aunt is lovely, enjoy her food! Good point about cooking the lentils in unsalted water first, then salting when the rice is added. I’m glad to see you back in the blog world, and hope your research program is flourishing! Ristha has nothing to do with mjadara. Ristha are the middle-east pasta. They look like tagliatelle and are traditionally served with a egg-yoghurt-garlic sauce.There are also the oval vormed short rishta. I must make this lovely dish!!! in our family and many others throughout the Levant we discard the lentil coooking water after they have cooked al dente and add fresh water to the lentil rice mixture..the lentil water has a heavy overpowering taste and murky coloring..by doing so you have much more refined easier to digest dish and the flavors meld better and yet remain distinct…we serve this dish with a finely chopped tomatoe.cucumber salad dressed in lemon and mint olive oil..exquitsite..
Love the fried onions – reminds me of the ones on top of kosharee here in Cairo. I hope you have a wonderful time on your fulbright. Still want to hear all the details. Thanks for the tip about the water, Samir. When I make mujaddara at home, the lentils usually absorb almost all the water. I will update the recipe tomorrow, to include this tip. Ahlan bik!! your appreciation of my comments is very refreshing like your blog..of course there are variations of this dish from family to family ,region to region etc..but I think this step is great if you want an easier to digest, more refined dish.. forgot to mention we also add a dash of black pepper along with the salt and some of the cooked onion and its oil to the cooking dish,reserving most for the final garnish,, others add spices ie cumin..
Wow! A new adventure! I imagine I would also gain a lot of weight if I was there…the food sounds awesome! i soooooo miss ur blog! thx tony! Just found your blog. Love the food and the pictures. Good luck and enjoy your Fulbright experience! Tony, sounds like your trip is off to a fabulous beginning! Enjoy every bite–I can’t wait to hear more! I have always wondered about the crispy onions and how they are done. 1st time to see any directions on how to prepare. I will definitely try this. I love lentils any which way they are prepared. Tony, thank you for the wonderful recipe. Enjoyed this dish at a local middle-eastern restaurant and they served it topped with the carmelized onions (as have you) but in addition they served a little dish of yogurt mixed with chopped cucumbers to add atop the onions. The plate was garnished with pickled radishes and pepperoncini. I ordered the entire Mjeddrah dinner and it was served with a side salad that consisted of mixed greens, red onion slivers, black olives, chopped tomatoes, and a little chopped mint. The dressing tasted like lemon juice, olive oil, and honey. Warm pita breads were also brought to the table. In full view of the diners, custom drinks were prepared in a juicer with vegetables and fruits of one’s choice – I ordered strawberry/carrot/beet and it was surprisingly good! It was a delicious and memorable meal. Again, thank you for providing the recipe, for your wonderful photographs, and for your interesting blog. Most sincere best wishes to you.